I graduated with Distinction in my Master's in Music Performance Degree at the Royal Northern College of Music in 2015. I am excited to have moved back to the Bristol area where I have created a busy and exciting music career! I completed my undergraduate degree with a First Class Honours at the Royal Welsh College of Music and Drama where I studied with Angus West (WNO) and gained my first professional orchestral experience. Throughout my studies I have worked with some of the leading professors, Timothy Jackson, Julian Plummer and Lindsey Stoker. During my studies in Manchester and Cardiff I performed in various outreach workshops where my love of teaching developed further! Since 2014, I have worked as Social Staff with the National Children's Orchestras of Great Britain which inspires me to pass on my passion for music to my pupils. I am the Horn Tutor at Millfield School in Glastonbury and teach general Brass at The Royal High School in Bath. I also work for South Gloucestershire Music Hub as an Associate Music Teacher and Conductor. I am thoroughly enjoying working within the setting and my experience of teaching keeps growing! In 2016 I was lucky enough to be offered a Horn Tutor Role for a Summer Course with the National Children's Orchestra of Great Britain. I have a real passion for teaching and having recently finished at Music College, I have fresh and exciting ideas which I want to pass on to my pupils to help them reach their full potential, while also having fun. Throughout 2014 and 2015 I worked with Anthems Music and Creative Arts, where I taught trumpet and piano in both group and individual lessons. I have participated in voluntary outreach projects where I assisted children in composing their own songs and putting it together to make a show where they received the opportunity to perform to their family, which was a very special and exciting moment in my career. I am an experienced musician and have performed with numerous professional orchestras, including the Royal Liverpool Philharmonic Orchestra and the Welsh National Opera. I am based in Yate. Runs on: Tuesdays, Wednesdays and Thursdays. I have always had a love of working with children and after gaining my first teaching job with Anthem Music and Creative Arts, realised how much I have a passion for teaching. I appreciate watching my students grow musically and teaching offers me more opportunities to help pupils fulfil their potential. Through my training as a musician, I have developed a variety of life skills, establishing self-awareness and motivation by having the discipline for my own individual practice, which I aim to transfer to my students. This enables me to organise my time well, in order to provide productive and effective lesson techniques. During all voluntary roles, I have developed a variety of skills. For example team work, commitment, time management, non-verbal communication and adaptability. These are all skills that I wish to further in my teaching. I am very used to performing under pressure, allowing me the ability to calmly approach demanding situations. I want to be able to pass on my experiences from my six years at music college to the younger generation and be able to support and empower them through any musical challenges. I am an active, approachable and positive person who is driven to produce the best in myself and my students. I hold an annual Summer Concert for all of my Private Students to give them opportunities to perform as a soloist and an ensemble. I also run a Brass Ensemble to offer ensemble skills to my students as this is a vital element to becoming a great musician. 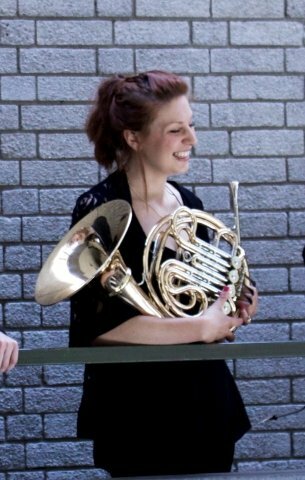 HannahFrom Liz (5/5): Hannah has been great at getting my son started on the trumpet. She is very thorough in a kind and enthusiastic way and he is absolutely loving his lessons. HannahFrom Sue (5/5): I really enjoyed my horn lesson with Hannah and felt that I learned a lot. Her friendly manner made me relax immediately and I felt able to try out all her excellent exercises. Thank you Hannah.